Not much happened today that I wanted to take a picture of. Mickey went to work. The kids went to school. I finally had some kid free time to look for fabric for an order. We had dinner and the girls went to activity days at church. Nothing really stuck out as interesting enough for a picture. I decided to go with something on my mental list of things I wanted to document. 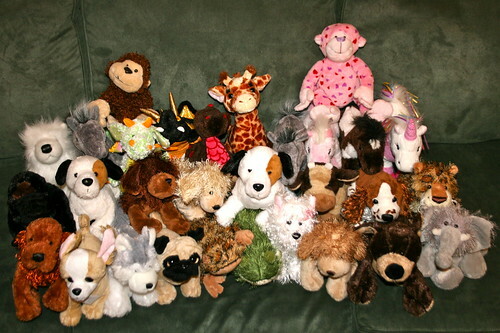 Our collection of webkinz. The girls started collecting these things a few years ago and then Kade and I got involved too. I got the first one because I wanted to be on-line and see what they were doing. And I'm also their sugar mama, sending them gifts and food and sometimes managing their accounts. As you can see we have a lot of horses and dogs but only 2 duplicates. Kade's into the reptile ones. Out of the 30 pictured can you guess which 3 are mine? Ok, my guesses are the elephant, the brown monkey, and the dog (bottom row, third from the right with the tan fur and light brown hair/long fur). Nope. Non of those are mine. The monkey is Meg's and the other two are Mat's. 27 left to choose from. I guess there's got to be a dog in the mix--for your former dog. I say brown, bottom left corner. The dog next to the gorilla is Meg's but I have the duplicate. He's a Jack Russell named Tommy Quinn. The giraffe is also mine. Her name it Talia. There is one more left. Anyone going to guess it? Her name is Lola. I don't know if that's a hint or not. What about the white dog on the front row? That's her. Jessica, I think you really know me.